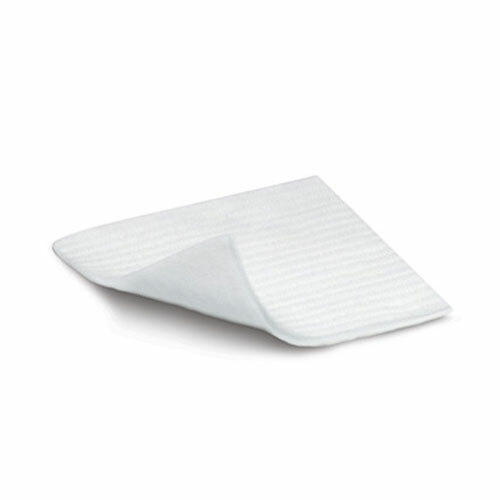 Smith & Nephew DURAFIBER Gelling Fiber Dressing, 4" x 4" - 10ct was designed with a soft sterile non-woven dressing composted of cellulose ethyl sulphonate fibres. This highly absorbent and conformable dressing rapidly forms a clear, cool gel on contact with the wound fluid. DURAFIBER Dressing was designed with a soft sterile non-woven dressing composted of cellulose ethyl sulphonate fibres. This highly absorbent and conformable dressing rapidly forms a clear, cool gel on contact with the wound fluid. This gel absorbs the excess fluid, locks exudate away from the wound, provides a moist environment to support autolytic debridement and conforms intimately to the wound bed. The high integral wet strength of DURAFIBER facilitates easy one-piece removal from moist wound beds and cavity wounds minimizing trauma to the wound and pain to the patient. DURAFIBER can be used in conjunction with ALLEVYN, PROFORE or PROGUIDE. Provides an ideal moist wound healing environment. Contains 10 DURAFIBER Gelling Fiber Dressing, 4" x 4". DURAFIBER is indicated as an absorbent, gelling dressing for the management of chronic and acute, full thickness, partial thickness, or shallow granulating exuding wounds. For example: leg ulcers, pressure ulcers, diabetic ulcers, surgical wounds, wounds left to heal by secondary intent, donor sites, tunneling and fistulae wounds, partial thickness burns, traumatic wounds, and wounds that are prone to bleeding such as wounds that have been surgically or mechanically debrided. DURAFIBER is designed to be left in place for up to 7 days. Whilst DURAFIBER assists in the management of wounds prone to bleeding, it is not intended to be used as a surgical sponge in heavy bleeding wounds. If reddening or sensitisation occurs, discontinue use. Cleanse the wound according to local clinical protocol. Remove the DURAFIBER dressing from pack, using a clean technique. Cut to shape if necessary. Apply the dressing to the wound and allow for a 1cm / 1/3in dressing overlap onto the skin surrounding the wound. Secure DURAFIBER with moisture retentive dressing (e.g. ALLEVYN), or other appropriate secondary retention. The other dressing may adhere if used on infected wounds, the infection should be treated to local clinical protocols. The dressing can be removed in one piece using sterile tweezers, forceps or a gloved hand. Ensure all dressings are removed. During the early stages of wound management, DURAFIBER dressings should be inspected frequently. Dressings can be left undisturbed for up to 7 days or changed when clinically indicated (e.g> if leakage or excessive bleeding is present). Local clinical protocol should also be taken into consideration. DURAFIBER is a single use only product. If used on more than one patient, cross contamination or infection may occur. Opening the dressing pack compromises the sterile barrier therefore any unused dressing should not be retained for application at a later date.